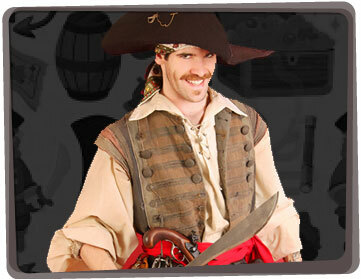 A treasure trove of fun abounds with our marvellous, rampaging pirates. Your children will be amazed and entertained with our chest of activities. Our Newcastle Pirates for hire will delight the kids with a hilarious magic show with tonnes of raucous laughter, physical comedy, audience participation, spells and funny props. They also have heaps other great party ideas to guarantee everyone has fun including spectacular balloon twisting, a treasure hunt, face painting, pirate party games, temporary tattoos and more! To make sure your birthday child knows they’re special; they’ll receive an extra special modelled balloon hat and balloon sword during the magic show. 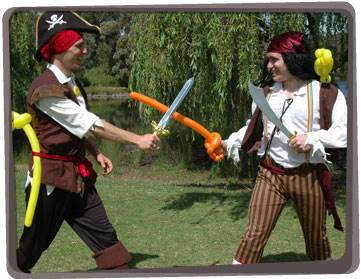 Our Yabadoo Pirates for hire in Newcastle are happy to customize a pirate themed party package especially for your needs to ensure it’s a success, no matter how big or small. Our Yabadoo entertainer (Spencer) was absolutely fantastic! Oliver (our four year old) was so excited to have a “real pirate” at his party. Spencer kept all the kids entertained for the whole 1.5 hours – not an easy feat given that there were over 20 kids and a whole range of ages! It made the party relaxing for us parents too… the kids were completely enthralled out in the garden while the adults got to have a decent conversation! Thanks so much. Next year we will be booking in one of your clowns as our little girl has already put in a request for one of your entertainers after seeing Spencer in action. I would definitely recommend you guys to others looking to have a fun, special, hassle-free event in Newcastle. Cheers, Nikki E.
Waiting for your entertainer to arrive? Grab some chalk and keep the litle pirates busy with this pirate party game idea! Make “islands” by drawing circles on the ground using colored chalk. The number of circles should be the same as the number of kids at the party. Name the islands with pirate things like ship, flag, poison, parrot, sword, eye patch, etc. If you want to keep things simpler, use numbers. The pirates hop from one island to another whilst music is playing. When the music stops, everyone freezes in his/her island. You draw an island name from a bag. The pirate who is in that island draws a big X on it and steps out of the game. Play the music again. This time, the pirates are not allowed to use the marked island. They can walk around it to get to the next island. Play until there is only one pirate left. 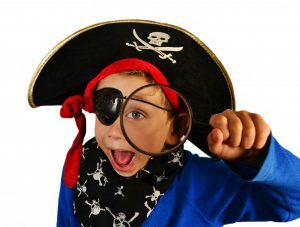 Give prizes to each child that is out of the game, but give a special prize to the winning pirate!